On our last night with family for the Christmas holiday, we ordered a killer sheet pizza from the local Brockport joint and broke out a slew of interesting beverages for the evening. These kept us company while we were bent over a puzzle featuring Coca Cola’s salute to females who served in the military in the early half of the 20th century. 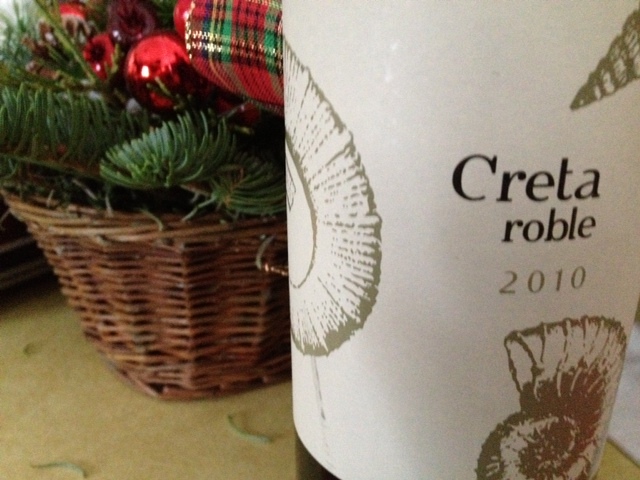 Never did finish the puzzle before returning home to NJ, but we did crush the ‘za and enjoyed the Creta Roble 2010. It needed some time to breathe but once it had its legs under it, the Roble was a nice find. Lots of dark flavors in this rich Spanish red! My tastes are sophisticated enough to pick out all the notes in play within the Roble, but I definitely grabbed on to the dark berries. Creta 2010 Ribera del Duero Roble, Spain. That dude (who gave it 90 points, in case those things matter to you) has a fun job–particularly on days when he gets to sample grapes like these. Wish I’d bought more than one! This entry was posted in Tempranillo and tagged Spain.